The Bears are 1-3 and Mike Glennon no longer has his starting job. Through four games, Glennon managed to turn the ball over eight times, and on Monday Bears head coach John Fox announced that rookie quarterback Mitch Trubisky will be the starter going forward. Maybe this is rude to say, but the same thing that I imagine makes Glennon look like a convincing NFL quarterback in the eyes of guys like Ryan Pace—he’s quite tall—is also responsible for the layer of comedy that comes with his failures. 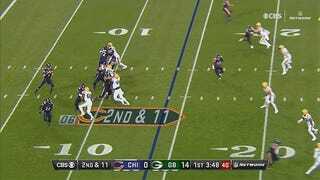 Glennon fumbled twice and was picked off twice during Thursday’s loss to the Packers, and I have to be honest with you, it was all very funny to watch. 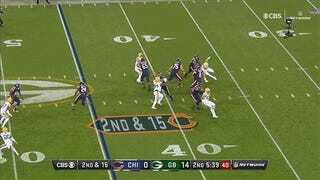 Glennon’s first snap of the game saw him drop back deep, looking for a receiver downfield. 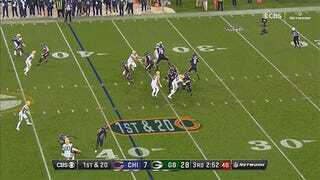 There’s a brief moment in the GIF below, just before Glennon gets strip-sacked, that he looks like he’s about to sling the most beautiful deep ball you’ve ever seen. 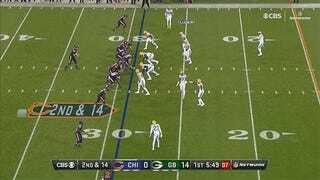 Pause the play right there, and Glennon is what coaches keep wishing he was: a big, strong quarterback with total command over the field. 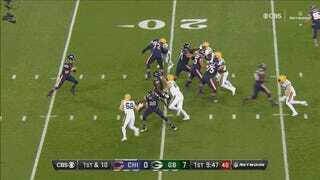 But then comes that small, hesitant hitch, followed by whatever weird bit of spasming led to the ball somehow floating behind Glennon’s head, and we’re right back in the real world, where Mike Glennon is just a big galoot who is long on limbs and short on time. Becoming a professional athlete requires levels of strength and dexterity that sad schlubs like you and me will only ever dream of having. Mike Glennon is in many ways an impressive physical specimen capable of doing things only a small percentage of the Earth’s population is capable of doing. He also looked like a drunk giraffe on roller skates during that play. That pass was so bad it made Jim Nantz raise his voice to “complaining about the estate tax while on the first tee” levels. Anyway, is Mike Glennon too tall to properly throw a football? I think we need to consider the possibility. Obviously, Glennon was never supposed to be a long-term solution for the Bears at quarterback. The $19 million he’ll earn was never really meant to be compensation for good quarterback play, but a fee the Bears had to pay for the privilege of keeping Trubisky off the field long enough for him to go through the mysterious seasoning process rookie quarterbacks apparently require before they can Lead The Men. Whether Trubisky is ready to start is no longer relevant, because Glennon only needed four games to force Chicago’s hand. In the end, $19 million didn’t buy the Bears much more than a few laughs.